A couple of weeks ago, I was invited to be part of the Beans Podcast, run by three friends and updated twice a week. I appeared as one of two guests to speak on a subject of our choosing and to join in the general banter. Released on Christmas Day, the episode is available here. But the main thrust of today’s entry is to talk about Star Wars. [Reader’s voice: On a writing blog?] Indeed, on a writing blog. I hadn’t previously been interested in the series; I’d only seen Episode I: The Phantom Menace on its release while trying to impress a girl. But 1½ weeks ago, I decided it was time to watch Episodes I to VII in the order of release then Episode VIII: The Last Jedi at the cinema, which came as a shock to some friends. It’s a huge time investment to watch eight films at around 2¼ hours each, and you risk letting your concentration wander, thus missing a vital plot point. However, I’m pleased to report I’ve now become really rather immersed in the universe. From reading articles online, it seems I’m more or less up to speed with the action so far, and I’m understanding a lot of the jokes and references. The next stop will be to watch some of the official spin-offs. Whether or not you’re a fan of Star Wars, it won’t be news to you that the plot of each one follows a formula. Yet you might be surprised to find out that almost every mainstream film follows a similar formula. On his website, Michael Hague discusses the six turning points of all successful screenplays, using Erin Brockovich and Gladiator for reference. The word ‘formulaic’ is often used negatively as a synonym for ‘predictable’. Predictability often stems from weak plot twists. A formula, by contrast, helps the screenwriter to keep the attention of the audience as the characters’ difficulties become worse and worse. Note that a happy ending isn’t necessary, merely a satisfying resolution of the preceding story; I refer you to A Clockwork Orange (1971) and Buried (2010). Next time you’re at the pictures, look out for the structure. A good writer will make the turning points natural and the formula invisible, but these elements will almost certainly be present. Today’s blog comes to you in podcast form. 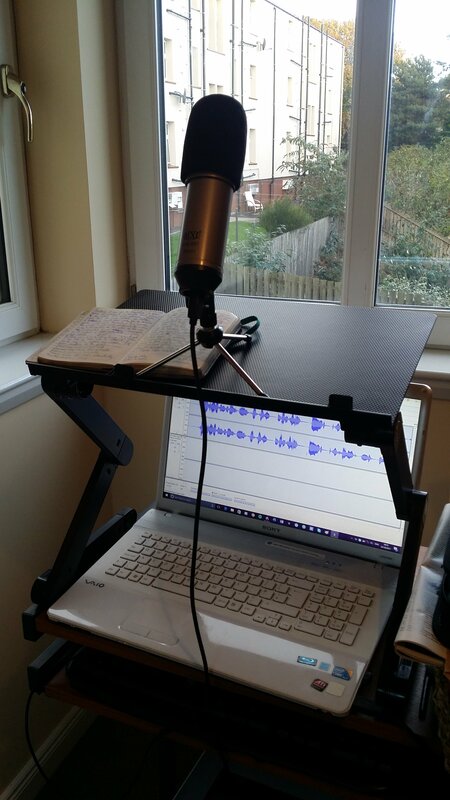 Here’s a picture of my makeshift recording studio.